“When are you doing this again?” This was the question of the day last year during the Free Shred Event–Prevent Identity Theft Day. 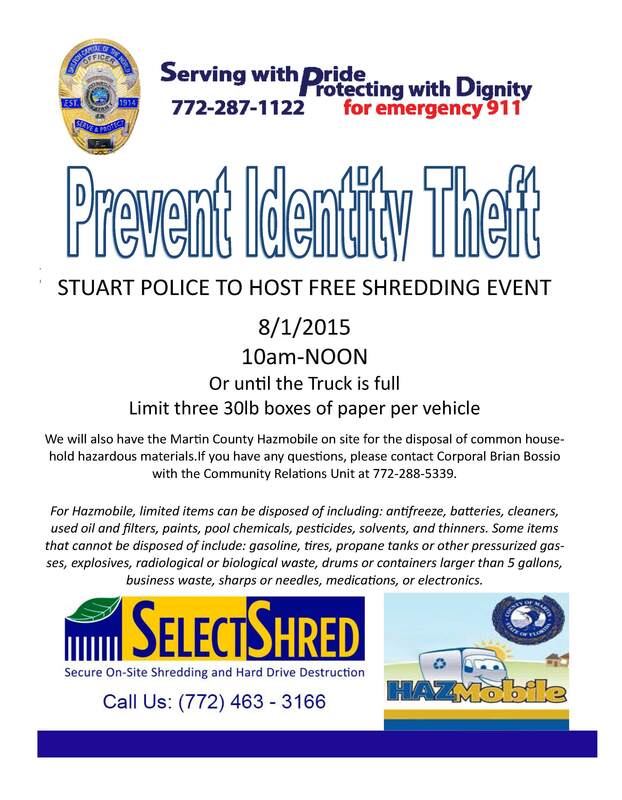 As they say, back by popular demand, residents can come again to the Stuart Police Department on Saturday, August 1, 2015 to have their confidential documents shredded on-site. Last year over 113 vehicles with happy and appreciative residents arrived at the Stuart Police Department. This year, the Martin County Hazmobile will also be there for the disposal of common household hazardous materials. 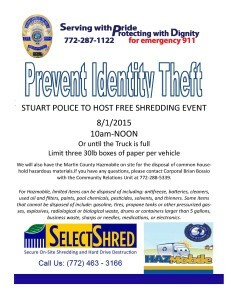 The Stuart Police Department continues to show their commitment by promoting shred events, increasing public awareness of identity theft, and encouraging shredding of personal documents. Residents see their documents placed into bins and hoisted into the shred truck. They can watch the shredding through the video monitor on the shred truck. Residents leave with peace of mind because they know that their sensitive information is securely destroyed. Florida has the nation’s highest rate of identity theft but there are many ways to prevent identity theft. 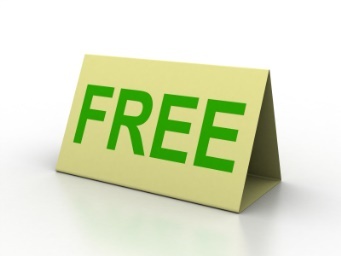 Getting free credit reports, monitoring your credit cards, and checking bank account activity are just a few. Shredding is another way to ensure that your confidential information is destroyed to prevent it from getting into the wrong hands. The following documents should be shredded when they are no longer needed: credit/debit card receipts, old tax records, insurance records, bank statements, cancelled checks, health records, financial documents, legal documents, credit card offer letters, billing information in the center pages of magazines, and all other documents with your social security number and driver’s license number. Beyond the free shred event, individuals and businesses must do everything possible to prevent identity theft. If you have accumulated too much to shred yourself, use a secure, convenient, and economical NAID AAA Certified company to destroy it. It is important to use a secure on-site shredding service. Even with this shred event, your documents are not carted away to be sorted and shredded at another location. All shredded materials are recycled into new paper products and kept out of landfills. Follow the Stuart Police Department’s Facebook page for more information. SELECTSHRED DOES MOBILE SHREDDING AND HARD DRIVE DESTRUCTION IN STUART, SHREDDING AND HARD DRIVE DESTRUCTION IN WEST PALM BEACH, SHREDDING AND HARD DRIVE DESTRUCTION IN NORTH PALM BEACH, SHREDDING AND HARD DRIVE DESTRUCTION IN JUPITER, SHREDDING AND HARD DRIVE DESTRUCTION IN PORT ST LUCIE, SHREDDING AND HARD DRIVE DESTRUCTION IN FORT PIERCE AND THROUGHOUT PALM BEACH AND THE REST OF THE TREASURE COAST. Customers were allowed to witness the document destruction through the truck’s video monitor. Here is what one person said after witnessing the on-site document destruction: “This is so interesting. Thanks for letting me watch. This is like a TV Show.” They were aware that their documents were destroyed immediately in their presence and could not be put back together. They were informed that all shredded materials would be taken to a recycling facility and would not end up in landfills. The peace of mind from knowing that their sensitive information was securely destroyed is priceless. The heightened awareness of identity theft and tax fraud is never far from anyone’s mind. Someone reported “I’m so happy to get rid of these tax documents. They go back to the year 2000.” Tax-related identity theft is an ongoing concern that increases with each passing year. Follow the link to read more: http://www.consumer.ftc.gov/articles/0008-tax-related-identity-theft. It was certainly like Shredding in Paradise in the 89° F temperature. We were shaded under a red tent provided by Lisa. Appreciative customers arrived on the lot to have their oil change and other auto service done. They also got some secure on-site document shredding done on a sunny Saturday morning in Stuart. We appreciated the opportunity to provide this shred event for Paradise Tire and Service.